On Tuesday we saw a report of an outbreak of H5N6 in Kon Tum Province, Vietnam - the first in that country since last April. Today, numerous Vietnamese media outlets are carrying reports of a small H5N6 outbreak in Ha Tinh City, nearly 500 km to the north. Leaders of the Department of Livestock and Veterinary Medicine Ha Tinh information, the unit has coordinated with the authorities of Ho Chi Minh City. Ha Tinh destroyed 250 ducks of Mr. Tran Van Nam's household (street 9, Daiai ward) due to H5N6 infection. Earlier, on September 24, when he flocked to the duck field, Mr. Nam discovered some dead, then some other children showed signs of eating less, eyes are lethargic, ruffled feathers, convulsions and death. Shortly thereafter, Nam informed the local authorities and authorities to take measures. By taking samples, the Department of Animal Husbandry and Veterinary Ha Tinh confirmed, his brother duck house positive for H5N6 influenza virus. Previously, H5N1 avian flu has also occurred in a commune in Ky Anh district, forcing authorities to destroy more than 2,000 sick and dead poultry. Fourteen years ago Vietnam was one of the first countries to be affected by the H5N1 virus, and for a time, lead the world in human cases and deaths; reporting 90 cases and 39 deaths over a 2 year period (2004-2005). Through a program of aggressive culling, poultry vaccination, and public education, by 2006 they’d gone from being the worst afflicted country in the world to being viewed as the `poster child’ for successful bird flu containment. Human cases, and outbreaks - while they still occurred - were dramatically reduced. Although H5N1 would return sporadically over the years, and HPAI H5N6 showed up in the summer of 2014 for the first time, we've not seen a human avian flu infection reported from Vietnam since two H5N1 cases were reported in 2014. 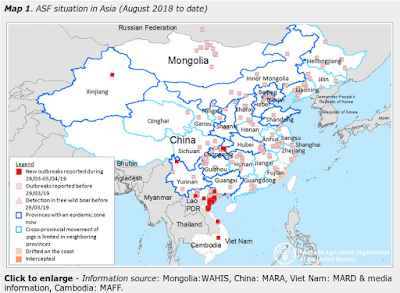 But success in containing bird flu can be fleeting, and with H5N1, H5N6, and H5N8 seemingly well entrenched in migratory birds that ply the East Asian flyway, and growing concerns that H7N9 will eventually follow suit and break out of China, Vietnam remains at risk of seeing new, and potentially devastating avian flu outbreaks.